We’ve all been there. We are walking around the woods contemplating the trees, when all of a sudden… crack! Sometimes it’s just a stick but it can be an unfortunate animal we have accidently stepped on. That is exactly what a woman in Tel Aviv heard when she trod on Chevy, a snail. Instead of leaving it to its own devices, as she saw it was still moving, she thought there could still be a chance to save it. Vets at the Haclinica hospital used epoxy to fix Chevy’s shell. The woman left Chevy in the good hands of the Haclinica veterinary hospital where a team of vets worked for hours to fix Chevy’s broken shell. “We needed a combination of patience and finesse with epoxy glue”, the clinic wrote on Facebook, where they documented the whole procedure. “We made sure the glue stayed outside the shell and did not penetrate the inner patch.” And like this, with care and professionalism, epoxy and the vets saved the snail’s life. Chevy’s case is quite similar to what happened to a beautiful Scottish female peregrine falcon named Candy by its rescuers, the Aberdeen Veterinary Referrals and some volunteers. She was unable to fly because of some swelling around her left elbow joint, which meant it could not rotate or extend fully. 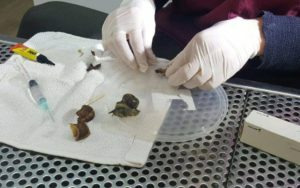 “Surgery was performed using external fixation involving four pins connected to a bar, and then covered in an epoxy resin to prevent accidental damage and infection”, explained the vets who treated her. Both Chevy and Candy could have thought about moving to Germany, where the team at Altenkirchen animal shelter in Weitefeld take care of 33 cats, 4 dogs and around 20 small animals which enjoy a special epoxy floor coating in every room of the facilities. 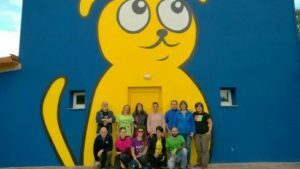 Or they could go to Asturias, in Spain, to the animal shelter El perro feliz – the happy dog-, where they would be able to run freely without fearing of sliding: “We chose epoxy paint for the floor because it makes it easier to clean. It dries fast and it is non slippery”, says Gabriel Bustillo, vet at the shelter. Sometimes humans are the cause of animal suffering, but we can also help them stay alive. These stories have a happy ending thanks to the professional and imaginative vets who came up with the innovative ways to use epoxy resins. Maybe one day epoxies become the solution for human injuries as well! Stay tuned. Read the full stories in The Telegraph, Evening Express, La voz de Asturias and Ak-kurier (Translations provided by Google Translate).